The Dow Jones declined 95 points or 0.9% (-1% week on week) in early trading to end at 11092 despite positive signs on Black Friday sales on worries over the euro zone's sovereign debt crisis and heightened geopolitical risks on Korean peninsula. Meanwhile, US$ gained the most since August against six major counterparts as concern that Europe’s debt problem will worsen and military action in Korea will escalate boosted demand for the U.S. currency as a refuge. The US$ rose against the yen for a fourth straight week, the longest streak in 20 months, after North Korea shelled a South Korean island and said “escalated confrontation” will lead to war. The euro fell for a third week versus the US$ as investors speculated Portugal and Spain will be the next European countries needing financial rescue. In overall, market in jittery mood amid external instability.Asian markets are likely to face persistent selling pressures today despite European governments agreed on an 85 billion Euro lifeline to Ireland and scaled back proposals to saddle bondholders with losses in future budget crises. China has called for emergency talks on the Korean peninsula as the United States and South Korea began their 3-day military drills yesterday. The persistent geopolitical risks in the Korean peninsula and euro-zone debt crisis should keep investors on their toes as they wait for clearer signs of stability before reentering the market. 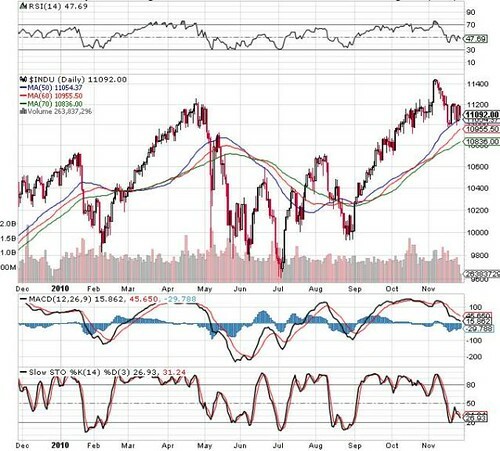 Daily Dow Jones is to consolidate within the 10900 to 11200 levels in the short term.